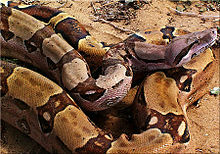 The Boidae (Common names: boas, boids, boioids) are a faimily o nonvenomous snakes foond in Americae, Africae, Europe, Asie, an some Paceefic Islands. ↑ "Boidae". Integrated Taxonomic Information System. Retrieved 14 July 2008. This page wis last eeditit on 15 Juin 2015, at 00:27.